Well, we're already in Louisiana sippin' Sazeracs, so why not stick around? A few skips east and we're arrived in the Peach State: Georgia. This sweet drink was named after the hero of Gone With the Wind when the book first came out in 1936. The novel is set is Georgia’s Clayton County and Atlanta, and it immediately became popular with its story of southern belles and the Civil War. This cocktail was created the same year, and it increased in popularity as a movie and a musical followed the novel in years to come. The Scarlett O’Hara is a tipple based on Southern Comfort, a fitting pick for the OG South — Georgia was the southernmost state in America’s original thirteen colonies. The peach liqueur dates back to New Orleans in 1874, and now SoCo is a staple in drinks like the Alabama Slammer and Southern Comfort Lemonade, making it the unofficial liqueur of the south. And don’t forget: Georgia is the Peach State, so a refreshing peach cocktail is a necessity when you’re in the hot and humid area. 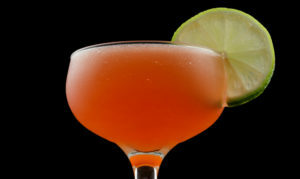 This cocktail is like a southern belle, with the tart lime balancing out the sweetness of the peach. Add some cranberry and you've got something easy-to-sip at your fingertips. Ingredients 2 oz Southern Comfort Dash of fresh lime juice Cranberry juice Lime wedge for garnish Directions Pour the Southern Comfort and the lime juice into a collins glass. Fill with ice, then fill with cranberry juice. Garnish with the lime wedge. The Rhett Butler goes together with the Scarlett O'Hara as good as, well, their namesake characters. Here’s how to make this slightly more sour variation of the Southern Comfort classic. Ingredients 2 oz Southern Comfort 1/2 oz Orange Curaçao 1/2 oz Fresh lime juice 1/2 oz Fresh lemon juice Lemon twist for garnish Directions Add all the ingredients to a shaker filled with ice and shake well. Strain into a chilled cocktail glass and garnish with the lemon twist.